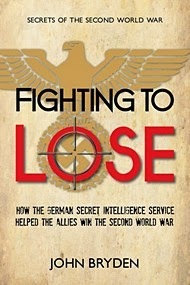 Fighting to Lose: How the German Secret Intelligence Service helped the Allies win the Second World War. John Bryden. Dundurn. 2014. There have been many books written about the triumph of the British double-cross system run by MI5 during World War II. The inept German Abwehr (German Secret Intelligence Service) sent poorly trained spies to Britain who were then turned into double agents by MI5. These double-agents sent incorrect information back to Germany and helped win the war. So goes the story. But even within MI5 at the time, there was head-scratching over the clumsiness of the Abwehr. Could they really be that stupid? That inefficient? The Germans, who were the paragon of efficiency? Shoulders were shrugged and the story persisted that the Germans were inept and inexperienced at espionage and that the British were sly and successful. But is that the real story? I had never questioned that story until I read this book. Bryden builds on the work of several other authors who, as early as the 1950s, suggested that the Abwehr was a nest of anti-Nazi officers who actively worked to undermine the Nazi war effort, particularly in regards to Hitler's plans to invade England. The invasion of England was widely seen as folly by the officers of the German Army and Navy. Admiral Wilhelm Canaris, the head of the Abwehr, ensured that the various offices of the Abwehr (Asts) were staffed by anti-Nazi officers who were loyal to Canaris. When orders came to prepare for the invasion of England in 1940, these officers ensured that espionage efforts against England were doomed to failure. Bryden suggests that the Abwehr was not as dumb as it appeared. Canaris got extremely high marks for intelligence operations that ensured that the invasion of France and the Low Countries was a success. There was also evidence that the Abwehr knew that their agent JOHNNY, known as SNOW to the English, was working for MI5. And since SNOW was connected with several other double-agents, including TATE and TRICYCLE, MI5s double-cross system was likely blown. On top of all that, there is strong evidence that the spies sent to England by the Abwehr, particularly in 1940 and 1941 were sacrificial agents. They were meant to be caught. On a whole, they were poorly trained, lacked English skills and their identity papers and ration cards were full of glaring errors and omissions. For example, some identity cards had a continental "1" written on them (a 1 with a tail on it). The Abwehr documents division could imitate every ink, piece of paper, stamp or seal, and yet the papers on the spies sent to England were flawed in so many ways. Finally, the author suggests that there was communication between Canaris and the head of MI6, Stewart Menzies. This has been suggested by several other authors. In the end, Canaris was removed as head of the Abwehr in 1944 and executed as a traitor in April 1945, a few short weeks before the end of the war. I found this book to be very readable. The material presented was eye-opening and the author made a compelling argument for his premise that the Abwehr was fighting to lose, at least against Britain. 5 out of 5 - eye-opening and thought-provoking.